Having to take notes by copying from a board or projection while a teacher is lecturing is challenging for any learner, because it requires students to multitask and constantly shift modes of learning. The process demands students to read, listen and write while making sense of the material. However, for students with dyslexia this teaching method can be disastrous. How Has Technology Impacted Note-taking? What are the Challenges Students with Dyslexia Face While Copying from the Board? Many students with dyslexia find difficult to reproduce words accurately and, worst of all, many have trouble finding their place on the board after they have looked down at their notebook. In addition, when under pressure to work quickly, students with dyslexia usually have problems in copying words accurately. They may mix up words in two separate sentences, misspell words, omit words or they may patchwork words that they see on the board with the words their teacher is speaking into a nonsensical hodgepodge of disjointed sentences. Even if they do record some legible and readable notes, they probably won’t learn or fully understand the content, and will require another teacher or tutor to reteach the material. What Does the Resent Research Say? Dr. Kirkby, with The Language and Literacy Group at Bournemouth University, researched how dyslexia affects learners when they are reading from classroom whiteboards. She discovered that copying from a board presents serious difficulties to learners with dyslexia.” The process involves a series of sequential visual and cognitive processes, including visual-encoding, construction and maintenance of a mental representation in working memory, and production in written form. These are all activities that can be challenging for students with dyslexia. In their experiment, they use a head-mounted eye-tracker to record eye movements, gaze transfer, and written production of adults and children that copied from a whiteboard. The results of the study showed that adults typically encode and transcribe words as whole words, but researchers found that even children without reading difficulties used only partial-word representations that often made note-taking ineffective. What Can Be Done to Remedy This Problem? · Offer your students with dyslexia and other learning disabilities reasonable accommodations such as a note-taker, use of computer or a copy of another student’s notes. · Present a copy of your own notes to the students at the beginning of class. Be sure to leave space so that they can add their own thoughts and connections. · Allow students to use technology like the Smart Pen which will allow them to go back and supplement notes with the recorded lecture, organize their materials, highlight important content and transfer their written words into typed text. · Post PowerPoint presentations online or make them available as downloads to your students. If you have any other thoughts or suggestions, please share them with us by commenting under this blog post. I am so pleased to feature an interview with Michael Bates: the creator of the Dyslexia Reading Well website and the Dyslexia Reading Well Parent Guide 2014-2015 (Click here to view more details). As a parent of a dyslexic son, Michael has created a wonderful and heart-felt site packed with valuable resources for individuals with dyslexia, parents, teachers and more. Erica: Why did you create the Dyslexia Reading Well website? Michael: Because there is overwhelming need for it. There are literally millions of parents with kids who struggle to read, many dyslexics themselves. I am convinced that most of those parents (and many teachers) desperately want to help their children, but are not finding the kind of information and advice they need; my website is intended to help them. I know for fact that many parents are struggling, because I was one of them. I wish we had caught the dyslexia in kindergarten or grade one instead of grade 5—it could have made everything much easier for my stepson. As a parent, community and even a society, we have to take the problem very seriously. Lives can be derailed and destroyed by reading disabilities. For example research shows that our prisons are full of struggling readers. While there are some good websites out there already, they are tiny compared to the scale of the problem and the need. I felt that reaching even a few parents would make the site worthwhile; but today, seeing the number of daily visitors, and the kind emails I receive every week, I know that many people are benefiting. This feedback is extremely rewarding. Erica: Why did you create the Dyslexia Reading Well Parent Guide? Michael: Even though I try to make the website easy to navigate, I recognize that parents have very limited time and can’t get to every page that may be of interest. So I pulled together what I thought to be the critical information parents need and assembled it into one easy to read guide. It’s not a short guide at 80+ pages, but I think it is very easy to navigate and as an e-book, very portable. To be sure, there is more that parents need to know beyond the guide, but if I had been referred to this guide when we first discovered that my stepson was struggling to read, it would have put us on the right path, helping us avoid false starts, unhelpful programs and wasted money. That’s what I hope it can do for other parents. 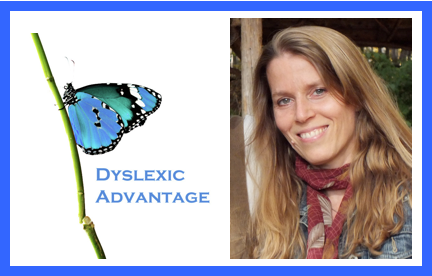 Erica: What types of resources can parents find in the Dyslexia Reading Well Parent Guide? Michael: The guide is meant to present the essential information: definitions, lists of symptoms and signs and an explanation of causes. There is also some information on assistive technology since that is now so important for every student. But where I think the real value of the guide lies is in the resource lists. First there is a table of reading programs that work best for dyslexic students and an explanation of why they work (the critical content and methods). This can help parents find a reading program that will make a real difference. Second there is a state by state list of schools, tutoring centers and community groups. This table will point parents to local resources. For example, I had no idea that there are so many schools for dyslexic kids until I started building my website. Also most parents don’t know that there are very active support groups such as Decoding Dyslexia and the International Dyslexia Association that have branches in most every state. My guide helps parents discover those critical links and connections which in turn will lead to more information and support. Finally there is a state by state list of legislation relating to dyslexia. In some states there is legislation requiring schools to assess young readers for dyslexia or laws requiring teachers to be trained for teaching dyslexic students. By knowing ones state mandates (and other states) parents are in a stronger position to assess how their school is performing or where their child might be better served. Erica: Will you be updating the guide yearly or creating other guides? Michael: My plan is to make minor updates on an ongoing basis (two already since October) and then make one major annual overhaul before releasing the next edition each October in conjunction with Dyslexia Awareness Month. One of the benefits (and challenges!) of authoring an e-book is that it can be kept current with the latest science, news, product releases and policy changes that are going on. I am also currently working on a guide for U.K. parents and after that one for parents right here in Canada. Finally, I am thinking about creating other guides for teachers and students. Erica: What kind of feedback have you received about the Dyslexia Reading Well Parent Guide? Michael: The feedback from my Facebook page and through the website has been very positive and encouraging. It’s not yet on Amazon, where it will be publicly reviewed, but it should be soon. Of course as an author, I see room for growth in future editions. For example, I look forward to adding content on Individualized Education Plans, homeschooling, and new assistive technology, which is always in a state of flux. If you are interested in viewing a free sample or getting the guide, Click here to view more details! You won’t be disappointed. I’m so pleased to feature this heart-felt and beautiful piece by my dear friend and fellow dyslexic, Stan Gloss. Stan provides a glimpse of his “marriage to dyslexia” and shares his life’s challenges as well as his most recent realization that dyslexia is in fact a gift. golden anniversary is an amazing milestone to reach in any relationship. It is even more remarkable when your marriage is to Dyslexia. screen, I had to concentrate on using both eyes, or half the screen went black. were referred to the Reading Research Institute in Wellesley, Massachusetts. was happily married to Dyslexia too. star to her giant golden seal. I felt ashamed and defective. divorce for irreconcilable differences was impossible. strength to keep going? The key to my survival was finding mentors and advocates. but I was still in the trenches. Government Center T stop, as well as weaving between people to catch the next trolley. When I was in the subway, I was free, independent, and in control. between the real world and what I was studying, there was no looking back for me. moved forward – fast forward. was in a struggling relationship. I hope Stan’s story inspires you, too, to recognize the gifts in dyslexia. I’m so please to feature and share an interview with Sean Douglas and his Codpast! Sean is an internet broadcaster with experience in broadcast TV news, public relations, corporate communications and podcasting. After Sean was diagnosed with dyslexia as an adult and met other successful dyslexics, he created the Codpast, to share those stories and more with the public. Can you please give us a brief description of The Codpast? can come to find compelling and interesting content. did this have on you as a person and a professional? dyslexic strengths, so once I got the diagnosis I kind of just forgot about it. are your most amazing talents? What are the ways that dyslexia creates challenges for you? 5) What can people learn from your website and podcasts? contemporary, so we do things like our Top 10 videos. Who were the two most interesting people you interviewed and why? his career to the next level. What have you learned from creating the Codpast? things as you, they suddenly become less strange. What can people do to support your effort? supports this cause as, at the moment, I fund the show myself. ClaroRead: ClaroRead is text to speech software for the internet as well as scanned books and documents. It includes visual tools such as colored text, highlighting, and it offers an enhanced spell check, homophone check and thesaurus. ClaroRead can even read the words as you type. AudioNotetaker: Audio Notetaker offers a visual and interactive form of note-taking where audio, text and images are used to create comprehensive notes. Global AutoCorrect: Global AutoCorrect allows you to focus on your writing as it automatically corrects your spelling as you type. Encrypted dictaphone: This device records audio and is converted to another form that can not be easily understood by anyone but the authorized parties. Sean also shared a video of a recent speech that he gave at the Moat School in London on how Dyslexia has impacted his work life. Thanks Sean! While reading, tracking across the page from one line to the next can be tricky when the text is small, but for students with dyslexia or weak reading skills it can be a problem regardless of the font size. Tracking is the ability for ones eyes to move smoothly across the page from one line of text to another. Tracking difficulties happen when eyes jump backward and forward and struggle to stay on a single line of text. This results in problems such as word omissions, reversals, eye fatigue, losing your place while reading and most importantly it can impact normal reading development. Fixations: The ability to hold ones eyes steady without moving off a target. Saccades: The ability to jump to new targets that randomly disappear and reappear in a different location. Pursuits: The ability to follow a moving target with ones eyes. Use Beeline Reader to read ebooks, PDFs and webpages will assist with tracking. This free technology makes tracking faster and easier by using a color gradient to guide your eyes from one line of text to another. Play ping pong – but more importantly, watch others play the game. Sit on the side of the table and keep your head steady. Watch the ball, moving your eyes back and forth across the table. Get a book but only read the first word and the last word in each line. Continue down the page. Time yourself and try to beat your speed. If reading words is slow or labored, just read the first and last letter on each line. Go to the site Eye Can Learn and do their eye tracking exercises. Watch a metronome or crystal pendulum. Place the metronome or pendulum about 1-2 feet from your face, keep your head steady and move your eyes with the swinging metronome or pendulum. Use a laser pointer on a wall and watch the red dot while sweeping it across the wall: go up, down, left, right and diagonally. Use Apps like Dream Reader which will highlight the words while it reads the text. You can read along with the excellent synthesized voice options, or if you prefer, read the text yourself and turn off the audio. Adjust the speed so that words are highlighted while you read. Pick a common letter of the alphabet such as the letter “A.” Select a book, or article and scan through the lines of text as if you are reading, circling the letter “A” every time they see it. Read aloud. This helps the eyes and brain to work together. Play an internet version of Pong. My favorite is Garfield Tabby Tennis. Are There Any Products I Can Purchase That Develop Visual Tracking? Yes, check out the Reversing Reversals series to develop tracking as well as other important visual processing and cognitive skills that will improve the foundation abilities needed to be an excellent reader. Not all students require the same remedial process even though they struggle with the same academic difficulties. Diverse combinations of cognitive processing weaknesses and deficits can unite to create the “perfect storm” that can cause challenges with reading, math, writing, spelling and more. In fact, no two students have the same cognitive profile, so to provide the optimal solution, one needs to consider both a student’s strengths and weaknesses when designing a remedial approach. Our son (age 8) is dyslexic and we have been told that he has a good visual memory (so he can easily spot a correctly spelt word and can even easily distinguish the correct meanings of similar sounding words e.g. sea and see). However, he has poor memory retrieval – so he has massive difficulties finding the correct spelling of a word. We have found that if he really concentrates and can think of a place where he has seen that word written previously, then he can eventually extract the word – but it takes time and is not a practical way of remembering spellings in a busy classroom. I wondered, which of your resources would be good to try to help him to build on the skill of word retrieval? 1) Develop his visualization capacity. Visualization – which is a little different than visual memory (because your son has to conjure his own imagery) will help him become a better speller, reader, writer and will improve his long-term memory – auditory and visual. I think it will be his secret weapon! So the main publication that I recommend is Mindful Visualization for Learning: http://www.goodsensorylearning.com/teaching-visualization.html I think the two of you will have a lot of fun with this. It helps students develop their capacity to visualize through games that the two of you can play together. 2) Exercise his word finding abilities by playing the game Spot it. You can find it just about anywhere. I purchased it on Amazon.com. There are many versions and any of them would be great. It is all about practicing quick retrieval. I will place links to a few versions at the bottom of this blog. 4) Encourage him to develop his keyboarding skills and use a computer for his written work. A spell check will help him to see the words spelt correctly which will improve his spelling over time. Also consider purchasing Word Prediction Software, or a device like the Franklin Spellers to assist him with the immediate process. Before long, he’ll be a wonderful speller!! Keep in touch and I’ll be happy to help if you have any more questions. When considering the best remedial approach, investigate each student’s strengths as well as any reported difficulties so that a plan can be tailored to accommodate individual needs and achieve quick results. Ideally, it is best to meet with families as well as review prior testing, teacher comments and other pertinent materials. I hope you find this blogpost helpful. If you have your own suggestions, please share them below. Early intervention is key as it can remediate and work around upcoming academic difficulties. This is a very important approach for students with dyslexia. Recent reports suggest that dyslexia impacts 5-10 percent of the population. Now wouldn’t it be wonderful if this condition could be detected before children learned to read? Weaknesses could be strengthened and appropriate teaching methodologies could be selected, making the process of reading successful the first time. This could save the educational system a fortune and these young learners could sail through elementary school with an intact self-esteem. 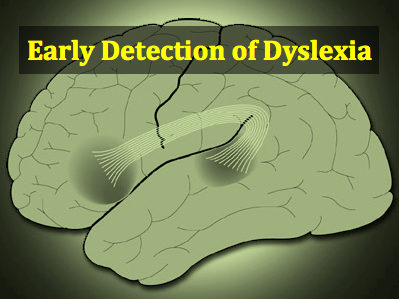 MIT News Reported, on August 14th, 2013 that research suggests that brain scans may help to diagnose dyslexia. Differences in the size of the arcuate fasciculus, the brain structure that unites two language processing areas, is now detectable. To learn more about this and their continued efforts, CLICK HERE. I hope you you found this helpful! I would love to hear your thoughts.